Should this item be out of stock at the time of your order, we would expect to be able to supply it to you within 1 - 2 weeks. 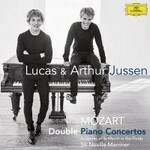 Mozart Double Piano Concertos is Arthur and Lucas Jussen's first orchestral recording, featuring two of the most famous works composed for two pianos. Ever since they performed for the Dutch queen in 2005 at the ages of just 12 and 8 years old and becoming the first Dutch artists to sign with the historic Yellow Label, Deutsche Grammophon, the Jussen brothers are regarded as something of Dutch national treasures.